The latest version of Parallel Access adds a much-requested feature – support for the iPad Pro. 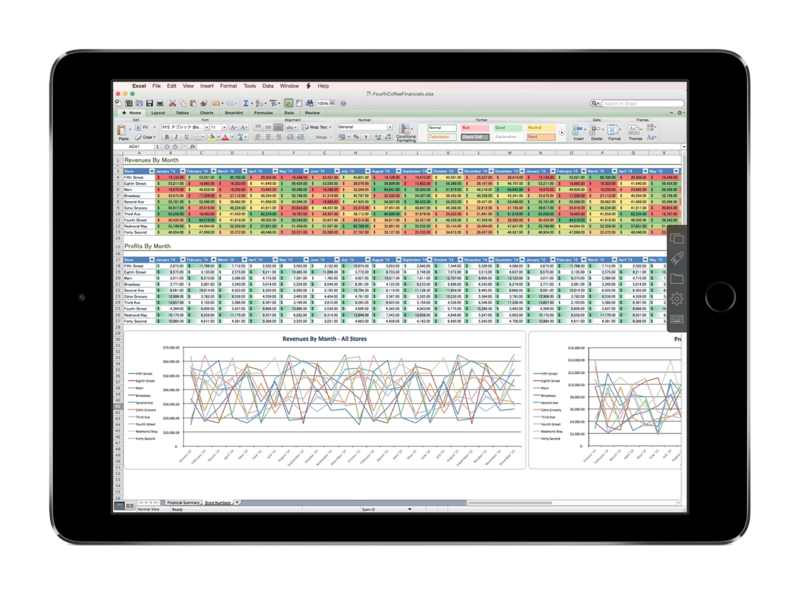 Parallels Access, which gives users a convenient and natural way to control their desktop applications from their tablet or phone, now has full support for the large screen of the 12.9” iPad Pro. Of course, this new version of Parallels Access – version 3.1 – still has the three resolution choices for your mobile device: “Best for your device”, “More Space”, and “Same as Computer”, but now those choices make use of the full resolution of the iPad Pro. 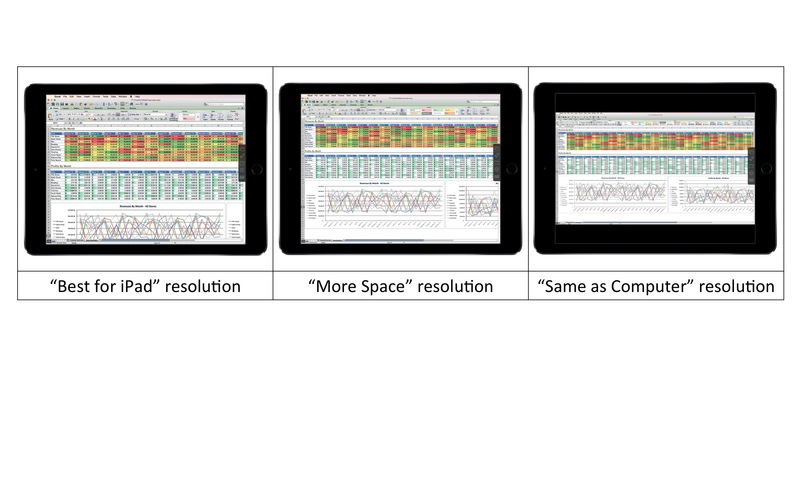 The image below shows these resolution choices on my iPad Pro for the same Excel spreadsheet when Excel is running on my 27” iMac. You might wonder why the “Same as Computer” image in figure 2 has letterboxing black bars at the top and the bottom of the iPad screen. This is because of the aspect ratio mismatch between the 27” iMac screen (2560 x 1440 resolution) and the iPad Pro screen (2732 x 2048 resolution). By letterboxing the image, we ensure that you see no image distortion on your iPad. In case you are not familiar with the new Tablet mode in Windows 10, it is a new Windows 10 mode that makes Windows 10 easier to interact with when you don’t have a mouse or keyboard. Tablet mode is very natural way to interact with Windows 10 when you are using Parallels Access on a mobile device to control your desktop or laptop Windows 10 PC. What about Split View on the iPad Pro? Fully supporting Split View in Parallels Access would require changing the screen resolution of the remote computer, and such resolution changes on the Mac or on a PC take several seconds. 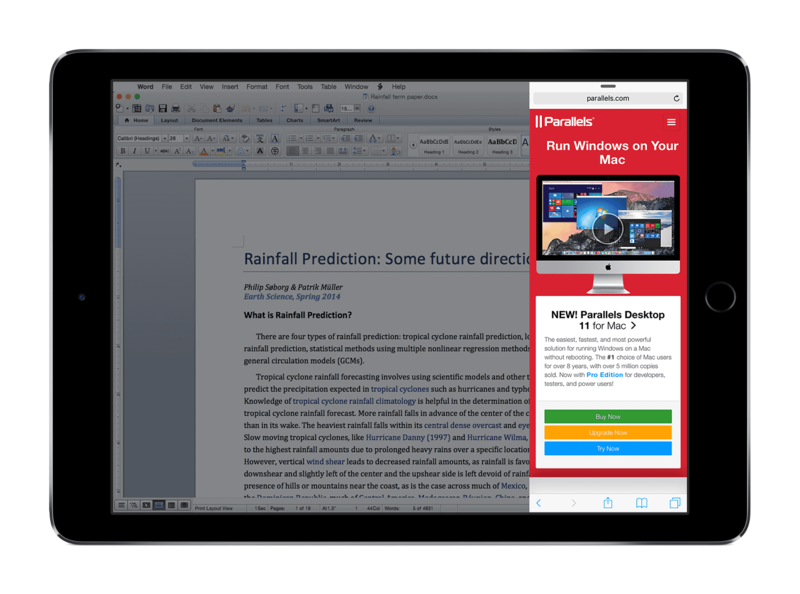 Therefore, Parallels Access cannot support Split View with the required smooth fluidity that iPad users expect. 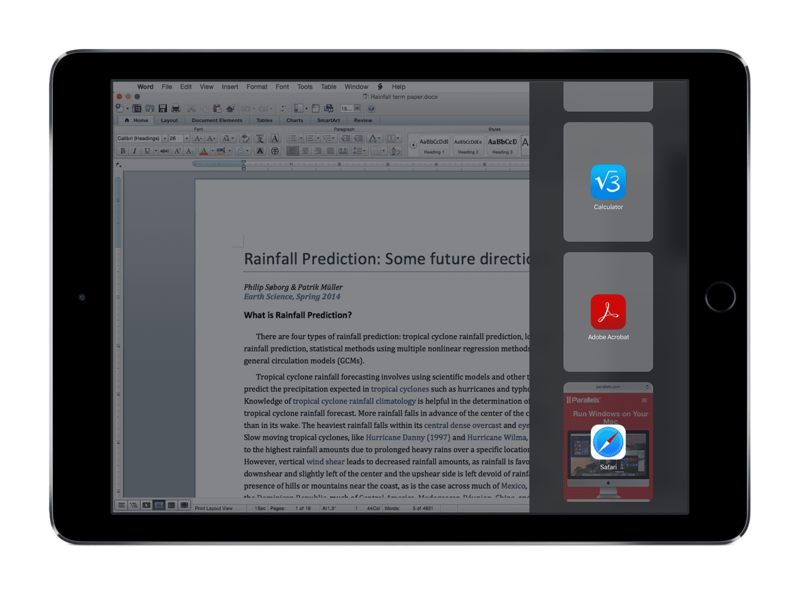 You do get the “Slide Right” behavior in Parallels Access (See Figures below), but without the ability to control screen splitting, or use both applications simultaneously. Parallels Access also enables you to access to your remote computer(s) from any computer or device with a current web browser (HTML 5); simply login to your Parallels account to select and access your computer without having to install any browser extensions. Parallels Access 3.1 is a free update to anyone with a current Parallels Access subscription, and there is a free, 7-day trial for anyone else. Download a free trial of Parallels Access now at www.parallels.com/access. Hyper-Converged Storage - What is it?